In an attempt to eat better we've tried eliminating as many processed foods as we can. 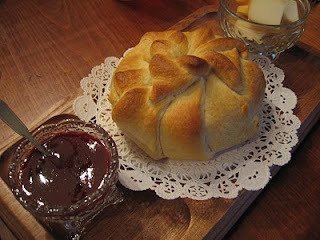 This recipe is so simple but it does use cresent rolls from a tube. If anyone has a recipe that would replace these I'd love to have it. Purchase a round of brie and wrap it in cresent rolls. Bake per instructions for the rolls. Remove from oven and cut into 9-10 pie shaped wedges. Serve warm with seedless raspberry jam.